The buzz around this weekend’s IMSA 24 Hours of Daytona is starting to get louder! The first teams have begun to pull their haulers into the infield, beginning with Mazda Team Joest, who put on an impressive show at the ROAR just two weeks earlier. On pit lane, Michelin has wasted no time making a statement with their new ULTRA Cart Dual Deck, which is now located at the very front of the grid! The arrival of Michelin’s new ULTRA Cart Dual Deck at Daytona Intl. Speedway marks the very first time this revolutionary new pit cart has ever been set up at the track for a race weekend. After making its world debut at the 2018 Performance Racing Industry show just a month and a half ago, the new ULTRA Cart Dual Deck is ready to go to work and show the world what the new standard in pit lane observation is going to look like. Presented almost exactly as it was set up at the show, the view from the expanded deck towards start/finish line is simply stunning. Thanks to the expanded deck, more engineers, sponsors, and guests will be able to take advantage of the unique view pit lane observation decks can offer. With IMSA entering its 50th year of sports car racing, they’re no doubt looking to kick off 2019 with a bang at the Rolex 24. A record 19 different manufacturers are set to compete in IMSA this year, with 13 competing in the 24-hour race alone. The rest of those 19 manufacturers are set to make their debut in the Michelin Pilot Challenge season opener this Friday. With more entrants comes increased levels of competition, and the race on pit lane will be more important than ever. It’s no secret that success behind pit wall translates into success on the track. 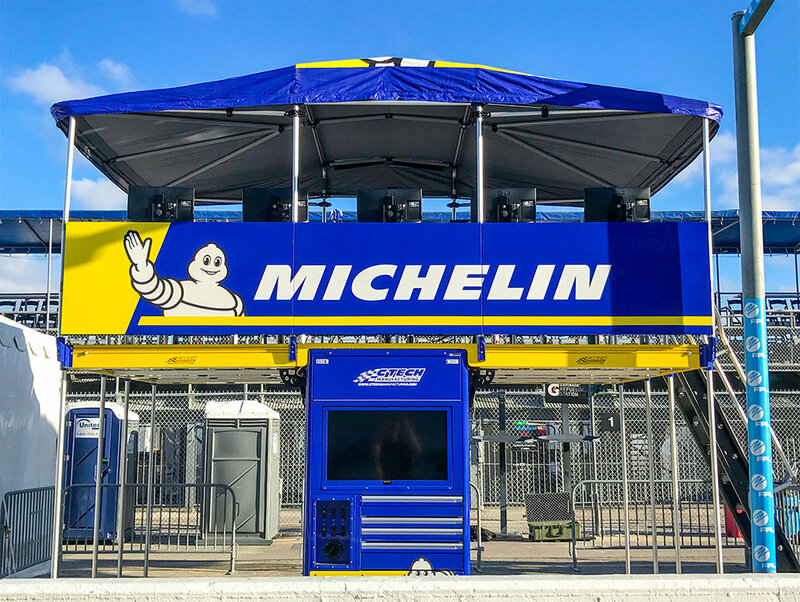 As teams battle for position and against the clock during the grueling 24-hour race, they will no doubt be looking at Michelin’s new ULTRA Cart Dual Deck and wondering what’s possible with this new pit lane asset. With Michelin becoming the new official tire manufacturer of IMSA competition in 2019, their team of engineers is now responsible for the tens of thousands of tires that teams will utilize throughout the race weekend. Typical of series-supporting tire manufacturers, Michelin works with each team on an individual basis to ensure that their race tires are working correctly at any given time. That effort entails monitoring tread wear and tire temperatures after a session, and advising the teams about different tire pressure settings and setup tweaks that may help them achieve the performance that they’re seeking.